Marchese Luca Spinola is a young wine company, but steeped in age-old tradition. In 2006, Andrea Spinola, the heir to the vineyards owned by the family in the area for centuries, decided to leave a corporate career with a multinational company in Milan and go back to his roots, to the region where he grew up and which he has always loved. Step by step, one investment at a time, he developed a company that produces a Cortese di Gavi appreciated all over the world today, from the USA to Japan, offering a wine whose versatile taste means it is suited to both Western and oriental cuisines. In 2015, the younger generations of the Spinola family also moved to Rovereto di Gavi, to “breathe the fragrance of this land, to grow up with its flavours and to experience in full the depth of our family’s roots in Gavi”. The Cortese di Gavi grape is a native variety from 1630, which grows only in this area. In 1998 it won one of the most sought-after international acknowledgements when it was awarded DOCG controlled and guaranteed designation of origin certification. Situated in Piedmont, the Italian region that produces the best wines in the world, the Gavi area enjoys a special microclimate: just the right distance from the sea, backed by the mountains, pure air and a light breeze. The Marchese Luca Spinola vineyards are located in a particularly favourable area, 200 metres above sea level, whose unique exposure ensures the vines receive sunlight all year round. The excellence of the grapes means no ingredients need to be sourced from outside the production area. 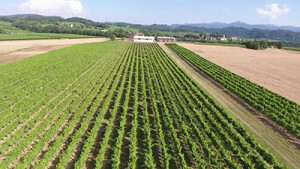 The R&D team headed by Andrea Spinola includes a distinguished oenologist, , Vincenzo Munì, and an expert agronomist with specific knowledge of the area, Davide Ferrarese. This vocation for experimentation led, in 2016, to the creation and production of the world’s first certified Kosher Gavi, available today in many European countries and the USA.